H. Gordon Tidey photo of 17in Coal Engine No. 3435. But where? And what are the wooden structures in the background. Try Willesden shed. I don”t think I”ve ever seen a photo with this background before, but there was (is?) a power station just west of the shed approach roads (south of Harlesden station) and the cooling towers seem to be in a likely position. The structures in the background are certainly cooling towers, almost identical ones are located at the LNWR built power station at Stonebridge Park for the Euston-Watford electrification. We have some photos of the towers at Stonebridge Park in the archive. These towers are positively cooling towers. There were very similar cooling towers at British Steel, Workington, Cumbria until about 25 years ago. There appears to be too many towers to be Workington, judging from photos I have in my collection. They were often located near to the blast furnaces at an iron or steel works. This is a bog standard design for a cooling tower prior to the introduction of concrete pattern cooling towers. The location could be almost anywhere, where a large industrial site had wooden cooling towers. Acton Lane Power Station, just west of Willesden shed, had at least one of these wooden cooling-towers as late as 1952. There were others at Crewe c1950 but too far from the sheds. Certainly at Willesden. This is H. Gordon Tidey photograph number S465, with his pictures S460-S474 all being recorded as Willesden MPD. About 1922-3. I don’t think this is Willesden. It is tempting and the presence of a coal elevator on the left suggests a photo taken from Willesden shed. The single chimney suggests Acton Lane power station as well. However I lived just alongside Harlesden Station in the 1940’s and 50’s and to the best of my recollection there are just too many towers in the photo. I cannot be absolutely sure but I really do not think its Willesden. Confirmation of the location can be found on page 10 of LMSR Locomotives Vol. 3 by H. C. Casserley (Bradford Barton, 1976). HCC's photo of LNW no. 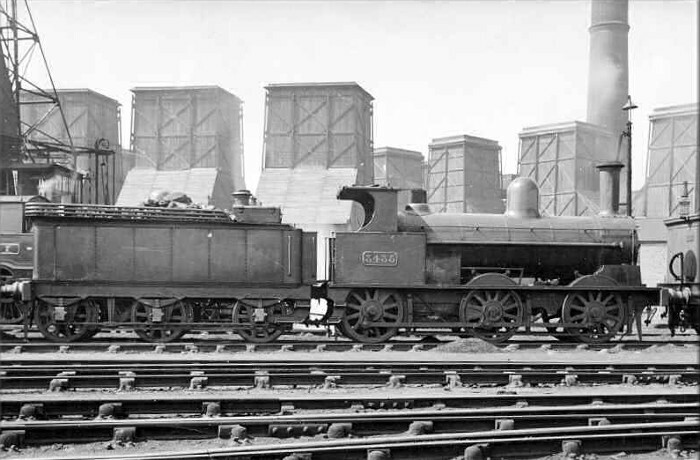 5000 Coronation, has three wooden cooling towers (those on the left in the mystery picture) in the background. His caption: "taken at Willesden in May 1924".